Holiday Specials, Deals, and Low Prices At Sunny's Pools and More! You know that Sunny’s Pools and More is always having a sale or special discount on our stock of pools, hot tubs, and more. We wanted to give you the full rundown of what we have going on right now before the holidays! Now you can give the perfect gift for your pool, hot tub, or game room enthusiast at a special discount. Right now for the 2017 holiday season, we have discounts, rebates, BOGO deals and more! Check them all out below! At all our Sunny’s locations, we’re running deals on Dimension 1 hot tubs and our stock of Viking hot tubs. You can get the hot tub of your dreams this year at Sunny’s Pools! Huge cash rebates on Dimension 1 spas with some savings of up to $4,000 dollars off the original price! Pick from their Bay, Reflection, and Home lines, call for details! Buy One Get a 5 piece outdoor fire pit free! Simply get a Dimension 1 Spa* from one of our Sunny’s locations and either get $500 off or get a 5 piece fire pit for free! 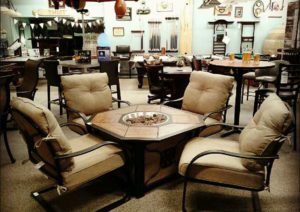 This 5 piece fire pit includes a propane-powered fire pit and 4 cushioned spring chairs. A great deal! Want a great deal on our floor model hot tubs? Right now you can up to 50% all our floor model Viking Hot tubs! We here at Sunny’s have the lowest prices in Michigan for Viking Spas, and we intend to keep it that way! Exclusive to our Flatrock location! Dimension 1 swim spa is on display and available on sale! Only at our Flat Rock location! Call for sale details and check it out online. Our Waterford location is down to their last two locally made indoor square saunas. We’re cutting the price but not the value! We’ll even take give “Trade First” credit as well. Call our Waterford location for details. 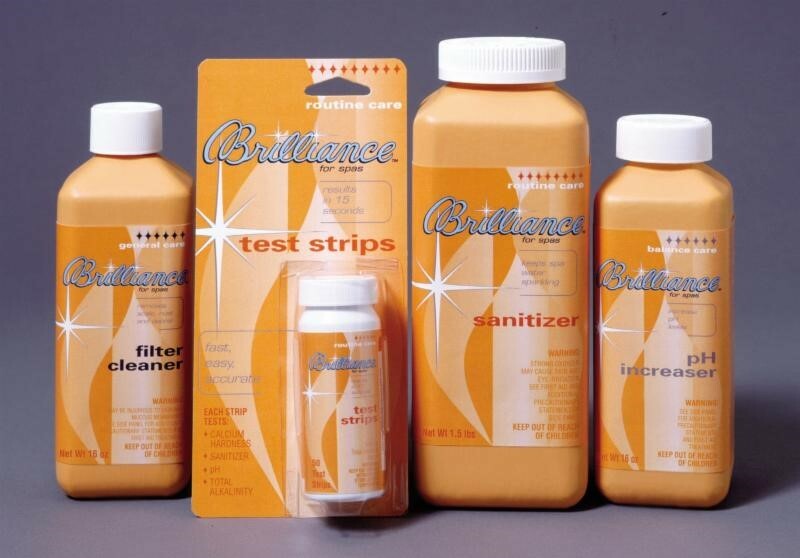 All our Brilliance Chemicals are buy 2 get 1 free, so you can stock up on all your hot tub chemical needs! We’re still running our $100 off hardcovers for hot tubs! We’ll even drop it off AND take care of your old hot tub cover free of charge! Want your summer to be filled with fun in the sun around the pool? Get your down payment in now for your pool time in 2018. We are giving huge saving and discounts on our pools, some up to 50%! We’re customizing each pool package, so visit your local Sunny’s for details. Why Should I Buy My Pool In Winter? Right now is the perfect time to get your pool installation scheduled for your local pool installer. Their spring schedules are more open this time of year and will ensure you’ve got your pool up and ready for the summer. Wait too long and you might be looking at 6-8 week wait time, and your summer can’t afford that kind of wait! 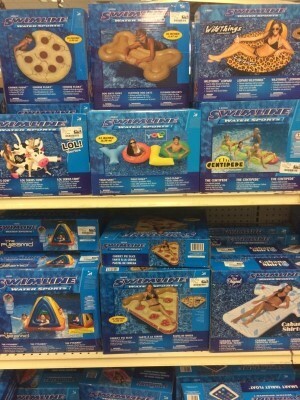 Right now all at our Sunny locations take 75% off summer pool toys! Get that pool toy you’ve always wanted but couldn’t afford. Want to give the perfect gift to your pool lover? Come in and get them a pool toy for Christmas! Want to stock up on chemicals for your pool? 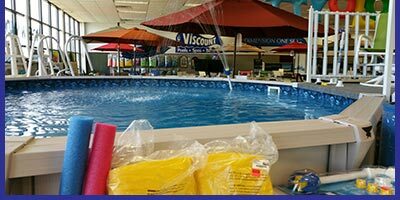 At Sunny’s you can get 25% off all our pool chemicals! Stock up and save big for the Spring season! All of our stores are currently stocking up on your perfect game room games. 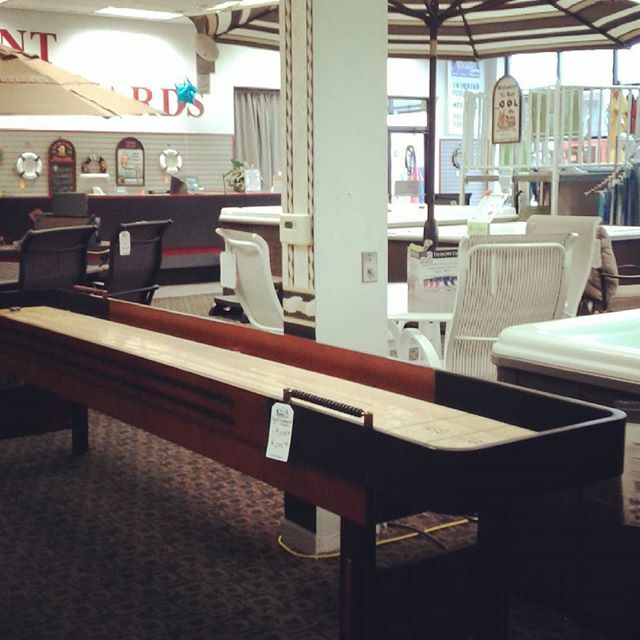 New and in stock at our stores we have new foosball tables, shuffleboards, pool tables, dart boards and more! Get the game that your game room has always needed, come to Sunny’s pools. Right now our pool tables are on special, some floor models are even up to 60% off! Call your local Sunny’s for details. 1 piece pool cues – buy 3 get one free! Want to give the perfect decoration to your pool, hot tub, or billiard lover? Take 15% our entire stock of wall decor and get them the gift that will make them smile! 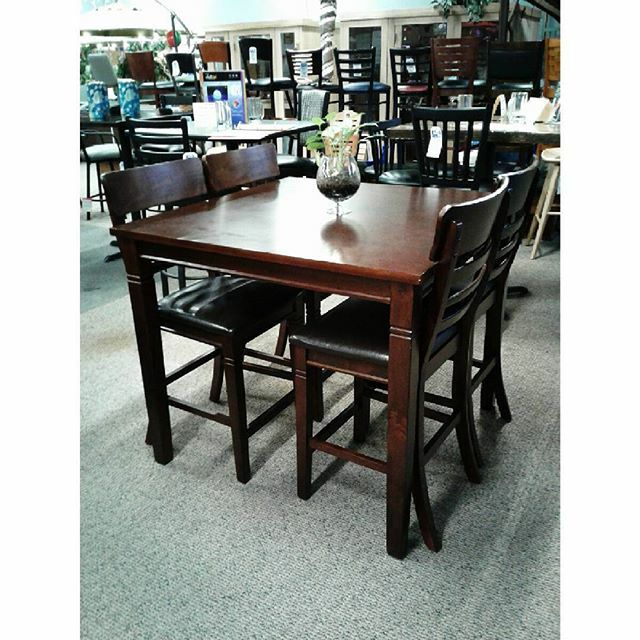 New at our Livonia location we have the perfect pub tables and barstools in stock! Right now you can get one bar/ kitchen stool free with the purchase of another stool! Get the perfects set for your kitchen or game room! Take huge discounts off all our floor model Umbrellas right now at your local Sunny’s. We’re giving away deals sales and discounts on your perfect outdoor patio umbrellas. Since we have many brands to choose from, call for details. New At Our Monroe Location! Great news! Our Monroe locations now have patio sets in stock! Now you can get the outdoor patio of your dreams close to home! Also at our Monroe location: Gazebos! We have 2 different types of gazebos for your purchasing pleasure. One is from A&B Accessories and made of a composite material that can stand the outdoor weather and makes for easy cleaning. The other is a Treasure Garden brand cloth summer gazebo. While this material is good for outdoor summer use we recommend bringing it in for the winter so it can be used for longer! Call our store for prices and availability! Now you know all the deals and specials we have going on at our stores. So what are you waiting for? Come out and get the perfect gift for the loved ones in your family! Happy Holidays!